Peabody Energy (NYSE: BTU) became the only non-Chinese equity partner in "GreenGen," the first near-zero emissions coal-fueled power plant with carbon capture and storage (CCS) which is under development in China. . . . The US$1 billion GreenGen project will use advanced coal-based technologies to generate electricity for Chinese families and businesses using China's most abundant energy resource. It will be capable of hydrogen production and will advance carbon dioxide capture and storage, providing a clean energy prototype to address carbon dioxide concerns. . . . Led by managing partner China Huaneng Group, the GreenGen Company will design, develop and operate an integrated gasification combined cycle (IGCC) power plant near Tianjin, southeast of Beijing. A 250-megawatt plant will be built in the initial phase, expanding to 650-megawatts in later phases. Project design and review is complete, a site has been selected at the Lingang Industrial Park, and construction is expected to commence in early 2008, with the first phase of the plant expected on line by 2009. The project includes multiple phases for additional generation and carbon capture. . .
China is the world's largest and fastest-growing coal-consuming nation, using coal to power nearly three-fourths of its electricity. . . .
China Huaneng is the majority shareholder in GreenGen. Peabody will own 6 percent of the initiative. Huaneng is one of the top 10 power companies in the world, and the largest power generator in the People's Republic of China. Both Huaneng and Peabody also are members of the FutureGen Alliance, which includes the world's largest coal companies and utilities partnering with the U.S. Department of Energy to develop and site a 275-megawatt technology prototype that also would achieve near-zero emissions with carbon capture and storage. FutureGen will select a host site this year selected a site near Mattoon, Ill in December for the $1.8 billion plant, and will begin electricity generation in 2012. . . .
Peabody Energy is the world's largest private-sector coal company. Its coal products fuel approximately 10 percent of all U.S. electricity generation and more than 2 percent of worldwide electricity. This is an indication that China is not totally ignoring the consequences of CO2 emissions from coal powered power plants. 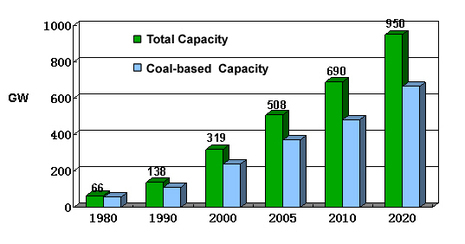 Initial operation in 2009 (probably without carbon capture) is an aggressive plan. The graph above indicates that construction of coal fired plants in the next 13 years is unfettered, presumably because of the industrialization and population growth in China. They are putting a lot of resources into renewables but it is only a drop in the bucket. What else can they do of any consequences? The Chinese would do well to use the captured C02 for EOR in the Daqing and Shngli oil fields, both of which are in decline. The value of the additional oil production would help to offset the additional cost of such "clean" coal plants. How far away are those fields? China is still trying very hard to reduce the SOx emissions. If China were forced to reduce the carbon emission, it might not be as effective as we all want it to be. The other point that Chinese officials are always using to argue against the immediate action on carbon sequestration, is that the energy consumption per person in China is far less than that of developed countries. Just came across this blog and found the above post interesting. Last month, a major report was put out that showed China to be on track for 18% renewable energies by 2020. Now, I have lived in China for 6 years and I have a helthy case of skepticism, however there is now a lot of pressure from citizens to clean up the environment. historically, any changes were top down (meaning Beijing pushed down). however, we are beginning to see where NGOs and citizens are being given more power than at any time, and this is will lead to change. If you would like to follow China's development, I invite you to view China at the Crossroads (www.china-crossroads.com). I am covering issued related to CSR, sustainable development, labor, etc there and I am spending a lot of energy on energy. Keep up the great work, and I hope to see you at the Crossroads. They are putting a lot of resources into renewables but it is only a drop in the bucket. What else can they do of any consequences? Hydro (both micro and large) is not a drop in the bucket in China. Even if big hydro isn't considered a good thing (fair case considering the Three Gorges Dam project), China is the world leader in micro hydro and solar thermal hot water systems. Wind is coming. Solar thermal maybe later (China has excellent desert resource). The Chinese energy plan for 2020 is very ambitious. Increasing coal plants' average electrical efficiency to ~50%, more nuclear and hydro, fast growth of wind and a bit more NG. Non-waste biomass is not a good idea in my opinion. PV yes already happening but systems must be cheaper for it to really matter. Much more aggressive than the US I'd say! i am Syed Tanvir Ahmed. i want to know that do you work in foreign countries like Bangladesh for electric power plant as partners of a Bangladeshi company. This was an age of innocence and happiness.God bless you all, and God bless America ! You are enernal beings, you are god force. You are god! improves posture and gait and even burns calories at every step and even while standing.